The film works of the faculty, students and alumni of the Wright State Motion Pictures program have been recognized by virtually every major industry award, including the Academy of Motion Picture Arts and Sciences and the Academy of Television Arts and Sciences. Our outstanding faculty of film professionals is dedicated to training future leaders in film production, as well as in film history, theory, and criticism. The Wright State Motion Pictures program offers two degrees. The Bachelor of Fine Arts (B.F.A.) in Motion Picture Production is a highly selective program that gives students in-depth training for professions closely related to film production while providing opportunities to develop their creativity and study the film medium. The Bachelor of Arts (B.A.) in Motion Picture History, Theory, and Criticism combines the breadth of a liberal arts education with the specialized appreciation of the aesthetic, social, ideological, and historical aspects of film. Our students have won national and international acclaim and awards in showings at major film festivals. Our alumni have moved quickly into successful careers and today are making names for themselves in all aspects of the motion pictures industry. Wright State alumni are working in virtually all components of the film and television industry. They hold such positions as advertising creative director, Hollywood cinematographer, feature film producer, computer special effects artist, videographer, writer, cinema scenic artist and designer, storyboard artist, crew member, director, DVD graphics designer, Technicolor specialist, and film editor, among others. Students who earn the B.F.A. in Motion Picture Production may qualify for positions in film, television, public relations, advertising, or industry, with professional film production companies in Hollywood or elsewhere, or as independent filmmakers. The degree can also prepare students for careers in the related fields of journalism, screenwriting, or the management of arts organizations. The B.A. in Motion Pictures is a general liberal arts degree that prepares the student for entrance into professions requiring knowledge of contemporary culture and film. Students who complete the B.A. degree may continue with graduate study in film and subsequent employment as a professional writer or teacher in a university. Their professional options also include working for a film archive, festival, library, museum, arts council, film or video production company, or publisher. Hannah Beachler, who received a B.F.A. from Wright State in 2005, talked about her successful career and answered questions during a discussion with performing arts students. The Motion Pictures program at Wright State University prepares students to meet the highest standards of the film industry. Continuing enrollment in the B.F.A. program is highly competitive and depends upon the student’s annual achievements as evaluated by yearly auditions, grades, and overall progress. 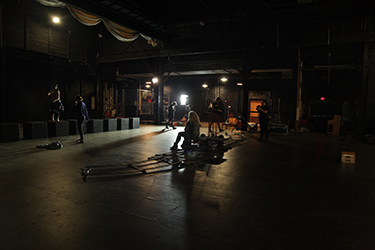 The Motion Picture Production Program combines intensive work in film production with studies in theory, history, and criticism of motion pictures, as well as related media. 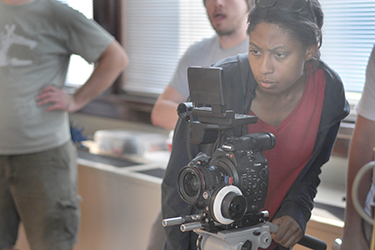 The Production program equips students for professional work in film or related fields or for graduate-level studies. The Motion Picture Theory, History, and Criticism Program is a liberal arts course of study that combines concentrated study in film analysis, history, criticism, authorship, and genre, with ample electives in related studies in other departments. Through the B.A. program, students may prepare for careers in film-related fields or for further study at the graduate level. Each semester, students have the opportunity to take specialty upper-level courses covering such subjects as cinema and sexuality, romantic comedy, Italian neorealism, philosophy and film, feminist film theory, the film noir, screenwriting, cinematography, Alfred Hitchcock, Sam Pekinpah, and experimental video art. View the Bachelor of Arts in Motion Pictures and Bachelor of Fine Arts in Motion Pictures program information, degree requirements, and graduation planning strategy in the University Catalog. Students have the opportunity to learn all aspects of film production by completing challenging projects during their junior and senior years. The Junior Project requires students to work together in small crews to make a 16mm sound film from conception to answer print. The purpose is to provide the film student familiarity with all production and post-production processes and techniques, as well as all lab procedures. The Senior Project generally requires the independent production of a significant film or video project in the capacity of director, producer, cinematographer, or art director, or the writing of a feature-length script. The purpose of this project, required of all B.F.A. candidates, is to provide the graduating senior with a thesis project and to serve as a culmination of the student's four years of study. Successful projects are screened in the Big Lens Festival, which is sponsored by the department and run by students. The B.F.A. program follows an open admission policy only for the first semester. thereafter, students must progress according to department guidelines in order to continue. After the completion of the freshman spring semester, prospective B.F.A. students must submit a Sophomore Audition Application. Only a limited number of students will be invited to enroll in the second year, based, in part, on grades and course work. At the end of the sophomore year, B.F.A. students must once again audition for entrance into the junior year of the program, a comprehensive process involving multiple meetings with faculty and review of all work done in the program. To be accepted to the third year, students must be disciplined and show promise of benefiting from continuing education. 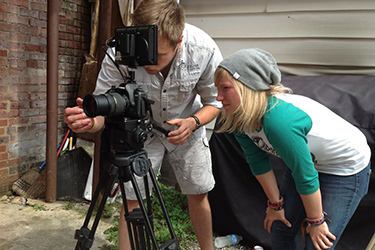 In their third year, all production students are expected to demonstrate growth in film technique and earn additional credits in film history, theory, and criticism, as well as credits in general education classes and electives. Any student whose overall grade point average falls below 2.25 will be suspended from production classes and the use of facilities until the grade point average is raised. The faculty reserves the right to suspend totally from the program any student who does not fulfill these continuing requirements or is not progressing satisfactorily in their motion pictures courses. Production students often take five years to finish the production degree—in part, for additional time to finish the junior or senior film project and in order to earn money to help support their studies. Students who are interested in the B.A. program generally follow the same program of study for the first year as the B.F.A. students, with one exception: instead of taking MP-1800 their first year, they will take theory elective in the spring semester. Students who do not have strong abilities to read and write about films or who do not get A's and high B's in all their theory classes their freshman year are strongly discouraged from pursuing this degree. To be successful, students must be passionately interested in the intellectual component of film and film culture. The Motion Pictures program at Wright State University is highly selective in each year of the program but operates with open admission during the first semester. If you qualify for admission to Wright State University, you may enroll in Motion Pictures courses during your freshman year. Students need to achieve a grade of A or B in the first required Motion Pictures class and demonstrate proficiency each year in order to remain in the B.F.A. Motion Pictures Production program. The students who succeed in the program are those who are accomplished readers and writers, in addition to having an appreciation of film. Prospective students should apply online for admission to Wright State University. Transfer students may be accepted into the program after a successful university admissions process. However, the program is geared to four years of training and transfer students can expect to take at least four years to graduate, although the final two years may not be full time. No courses taken elsewhere may substitute for certain Motion Pictures classes. Courses eligible for transfer credit include general education courses, photography, music, art, or television courses, which may fulfill the related requirements of the B.F.A. or BA degrees, and miscellaneous courses that may fulfill elective credits. The university generally follows a liberal policy in accepting credits, allowing virtually all credits earned at an accredited institution from courses in which the student earned a “C” or better. The Office of the Registrar is responsible for determining which credits are eligible for transfer. The Department of Theatre, Dance and Motion Pictures offers an array of scholarships based on talent, academic performance, and financial need. Beginning with their freshman year, Motion Pictures students are eligible to apply for scholarships and financial aid directly from the university. After their freshman year, Motion Pictures students also are eligible to apply for Continuing Excellence scholarships from the Theatre Department.